Whether an infrequent occurrence or a constant running narrative, internal self-talk ranges from the mildly irritating to the debilitating. Not always the classic sign of schizophrenia or other serious psychiatric disorder, it’s a common mental health complaint that can lead to depression, anxiety, phobias, and obsessive-compulsive thoughts if left unchecked. 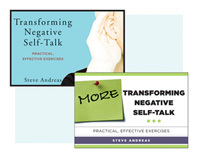 In this new two-book set of practical, take-charge strategies, Steve Andreas reveals how self-critical voices can be transformed and used to your own advantage. 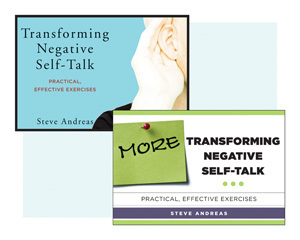 This package collects Andreas's popular first book, Transforming Negative Self Talk, with its sequel, More Transforming Negative Self Talk. It shows how to engage a voice rather than simply contradicting it. Rather than talk back or try to silence it, Andreas teaches readers how to join with a voice, clarify what it’s saying, ask for its positive intent, and use its specific abilities to their own advantage. Follow the exercises and you’ll be equipped to better manage your worst self-talk.